Floor Space › 92 sq.m. The apartment is situated in West Nice, in the Magnan Quartier. The beach is just a couple of minutes walk away as are mini super markets, small restaurants, boulangeries and pizzerias all around. This is a great area if you are seeking a beach holiday but wish to head into the city every so often. Frequent bus services run during the day and taxis all night to take you into the hub of the shopping areas and the buzzing nightlife of the Old Town. It takes just 5-10 minutes by taxi to the Old Town and Port areas. 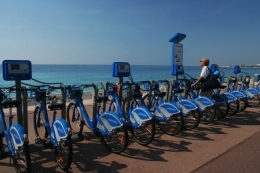 There are also ‘Velo Blue’ (public bicycles) available along the Promenade, which you can rent for a lovely ride along the seaside to the Cours Saleya market to buy fresh flowers and produce. Alternatively an easy 20-minute walk will bring you downtown and in less than 10 minutes to the famous Negresco Hotel. The apartment building is a classic Art Deco design featuring beautiful elements from this era such as marble floors, mirrors and decorative wrought iron accents. The apartment is located on the 6th floor (out of 7 floors) affording you glorious sea views. For your convenience there is a lift to take you to the apartment. The living area is open plan with the dining space and newly decorated in soothing neutral tones. The furniture is contemporary yet comfortable. The couch easily seats four and sits opposite the large flat screen TV (WiFi and cable are available with several foreign language news channels including English, Russian and Arabic). The room opens out onto a large glassed-in terrace, giving the space lots of light. The spacious terrace has gorgeous sea views and is designed to maximise the view and relaxation while providing shelter and privacy. The terrace has a wonderful outdoor sofa and table, and is the perfect spot for a glass of rosé with friends or family. The contemporary dining table next to the living area easily sits four and there is even a small workstation for writing your holiday postcards or memoirs. The kitchen is large and modern with dark floors and white cabinetry. It has a washing machine (no dryer), a gas stove, extractor fan, dishwasher and plenty of overhead cupboards. It is well equipped for guests who wish to whip up a wonderful feast from the fresh produce available at the local markets. The master bedroom is very romantic. It has a large American Queen size bed (160cm) with a white wood carved headboard. The chandelier adds further charm, as do the soft mauve-coloured walls. There are two bedside tables, each with their own reading lamp and there is a large window which bathes the room in light. However, to allow for a great sleep, the windows are dressed with heavy drapes and roll down shutters. The second bedroom also has an American Queen size bed and is decorated in a fresh and contemporary style. This room benefits from a small North-facing balcony with open views over the city. The balcony has a small table and two chairs, perfect for an early morning coffee. The spacious bathroom is decorated in beautiful black-filigree tiles with a splash of Parisian pink on the walls. The bathroom is fitted with a sink with an overhead mirror and a stand up shower over a full bath, great for a relaxing night in with a bubble bath. There is also a separate toilet, practical for two couples or a family, that is decorated with colourful prints from the 20th century. 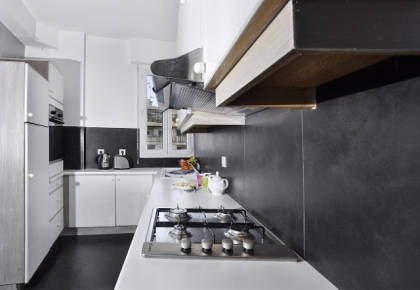 The apartment is situated in West Nice, in the Magnan Quartier. The beach is just a couple of minutes walk away as are mini super markets, small restaurants, boulangeries and pizzerias all around. Street view is provided to give you a feel for this neighbourhood in Nice Promenade. Drag street view to look around or click the map to change your position. 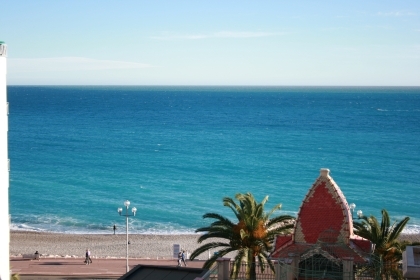 You are currently viewing a 2 bedroom holiday rental apartment in Nice Promenade. 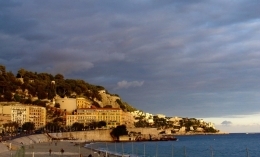 You could also view all holiday rentals in Nice, or just those in Nice Promenade. This apartment features a balcony and a lift. You could view all apartments with a balcony or all apartments with a lift. Alternatively, you could view all other holiday rentals in this price range (up to $263.88 per night), or you could view all our rentals across the French Riviera.